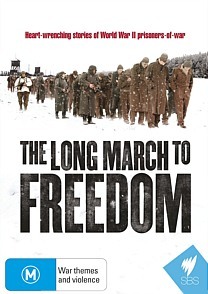 The Long March to Freedom DVD Review The Long March to Freedom stands as both a fascinating historical document and a profoundly moving tribute to the many thousands of men whose personal stories defined suffering in the closing weeks of World War II. In the final weeks of World War II, prompted by the imminent and (for the Germans) distinctly terrifying prospect of the Red Army’s arrival on the Reich’s Eastern borders, Hitler ordered the evacuation of his crumbling empire’s sizable network of internment camps. All throughout East Prussia, Poland, Czechoslovakia and other conquered territories concentration camp guards began rounding up tens of thousands of POW’s, political prisoners and other hapless souls and forced them to march back into Germany’s heartland, a distance of, in some cases, more than a thousand miles. The reason for the evacuation remains unclear: it is likely Hitler saw the prisoners, some of whom were captured five years earlier in France, as a possible source of slave labour. More likely he intended them as a bargaining chip in the final days of his Third Reich, or perhaps he simply wanted to deny the marauding Russians their own ready-made labour supply. Whatever the reason, the men who undertook ‘the long march to freedom’ underwent unimaginable privations during their weeks-long journey, from dysentery to starvation to lice, disease and beatings from the hands of their captors. ‘It wasn’t a march, it was a trudge’ comments one survivor on this excellent new documentary, which combines well-chosen period footage with thoughtful narration and an abundance of interviews with those who underwent the ordeal and lived to tell the frightful tale. Many thousands, of course, did not survive the journey, succumbing to starvation or sickness or simply freezing to death where they fell in the snow. This three-part series provides not only an insight into those terrible weeks, but a background to the prisoner’s stories and a comprehensive, incisive overview of the entire war itself. Convincing recreations are cleverly employed throughout and much of the archival footage is rare. The real value of the present series is, however, its matter-of-fact survivor testimonies, which are harrowing, heartfelt and frequently difficult to sit through. Surviving POWs tell of seeing their friends shot, of being taunted by strutting SS officers as they faced starvation, of being treated bestially by their German captors and of not knowing whether they would survive from one day to the next. The really surprising thing throughout is the lack of bitterness: all the survivors interviewed were emotional, pensive, full of regret for the indignities they’d suffered, for years and friends lost to the senselessness of a madman’s war. Yet none of the men seemed bitter. More than anything they simply seemed to want this important story told, with sensitivity and in its entirety, and SBS have done an excellent job of performing that very task: The Long March to Freedom stands as both a fascinating historical document and a profoundly moving tribute to the many thousands of men whose personal stories defined suffering in the closing weeks of World War II.